A Simple + Natural Life: history, cake, and a huge relief! Tuesday was also my 20th birthday, so once Marshall was released from TBS for the day we met up at the apartment and headed out to dinner. It was nowhere special or unique, we just went to the local Chili's at the shopping center across from our place. It was still good food though. 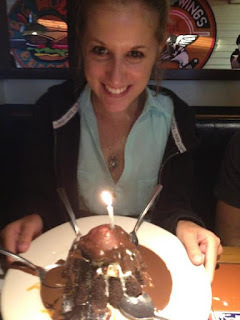 I also got a warm chocolate molten cake dessert... 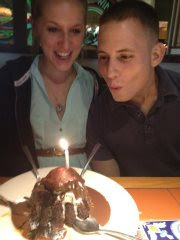 Here you can see Marshall trying to blow out my candle! Once my mom was satisfied with her pictures I was finally allowed to blow out the candle and get to work. It was delicious! 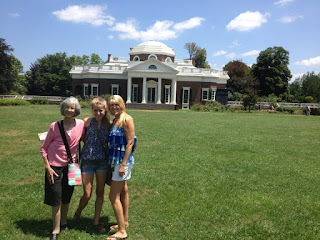 Also, if you can't tell - I'm wearing my new favorite mint shirtdress :) It was perfect for the weather that day! Here is our lovely group! It was really nice having family in town, and it was especially nice spending my birthday with family rather than with Netflix... 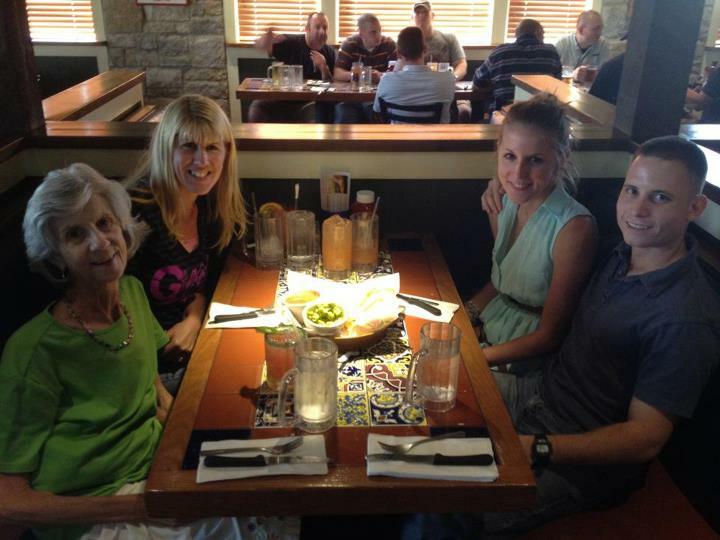 I'm so glad we got to visit with my mom and granny. I know they've done so much traveling the past couple of weeks! It was loads of fun. Here's a cool picture of a sign near the entrance, and a stone bridge..which you don't see much of nowdays. The weather was also beautiful that day as well, as you can tell! 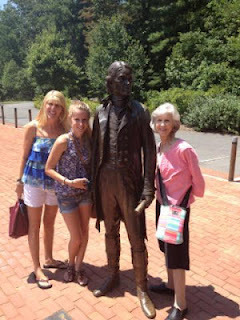 We all got our pictures with Thomas Jefferson :) After all, Monticello is his house - which he planned and built in a period of over 90 years - the last of those years being completed after his passing. Here is the front and the back of the house. It was so beautiful inside, but sadly because of the aged furniture, books, etc in there, no photography of any kind was allowed. It's just like at the National Archives, or any other museums like that. They don't want anyone damaging the history. But inside, there were so many books...hundreds...And it was only part of his library, others are housed with private collectors or the Library of Congress. You could tell how aged they were, along with everything else. There was also a lot of French and European influence in the decor because of all of the traveling between the US, France, and Italy as Jefferson was a foreign ambassador for a great deal of time. This is awesome. It's a statue of the young Thomas Jefferson..and behind him is the "Carters mountain range," which some recognize as Brown's mountain. I had to look that up since I don't know my geography or local mountain ranges as well as I maybe should..but I just think it's beautiful being able to see the mountains in the distance. Virginia is full of trees and beautiful scenery! 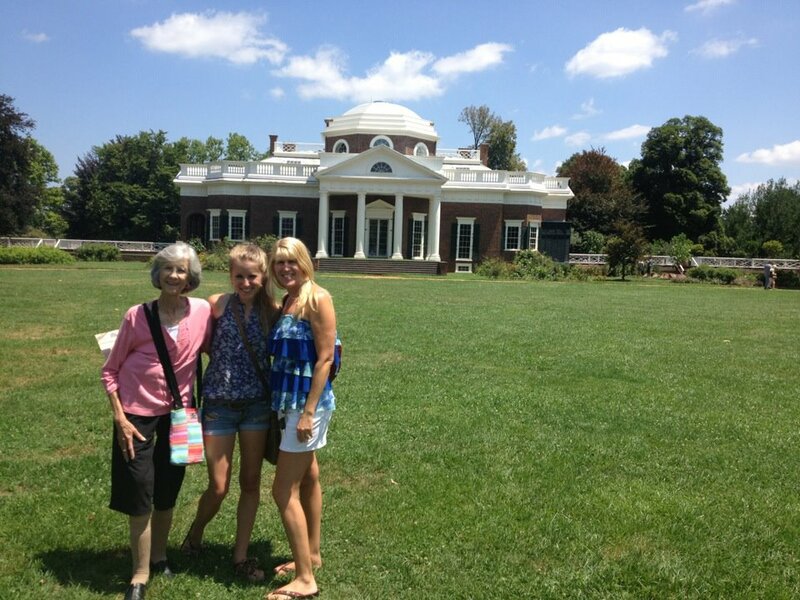 Also on Monticello is the Jefferson's family burial grounds. I think the earliest date we found was in the 1700s, and the latest was a couple of years ago, as the family still uses this site to this day. 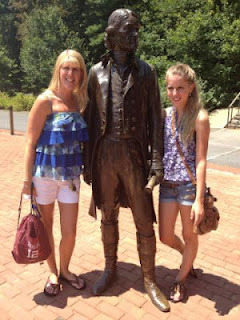 This is the monument/gravesite of Thomas Jefferson himself, shown above. It was a very real moment.